The Minister for the Constitution, Chris Skidmore, announced the policy statement which sets out how the government will remove the current 15-year time limit on British citizens who live abroad registering as overseas electors. The changes would give all eligible British citizens who have lived in the UK a lifelong right to vote in parliamentary elections. It would mean all eligible overseas electors are able to register to vote “quickly and easily, while maintaining the integrity of the electoral register and guarding against fraud”. “This statement shows how we will introduce ‘votes for life’, scrapping the 15-year rule. British citizens who move abroad remain a part of our democracy and it is important they have the ability to participate. “Following the British people’s decision to leave the EU, we now need to strengthen ties with countries around the world and show the UK is an outward-facing nation. “Our expat community has an important role to play in helping Britain expand international trade, especially given two-thirds of expats live outside the EU. “Expats retain strong links with the United Kingdom: they may have family here, and indeed they may plan to return here in the future. 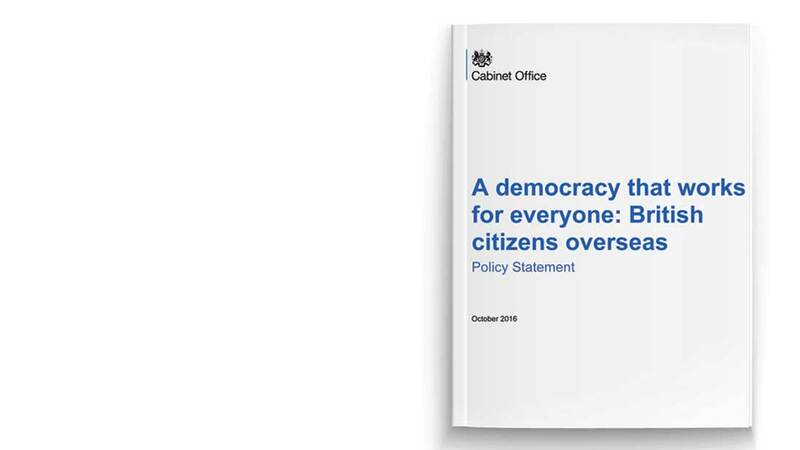 This proposed policy is the latest in a series of measures that the Government say will make it easier for overseas voters to “take part in British democracy”. During the last Parliament, the government introduced online voter registration and took steps to extend the electoral timetable for postal ballots. Further detail of the Policy to scrap the 15 year rule is available in a 19 page Policy Statement issued by the Cabinet Office. See below. Next articleThe Pauline Quirke Academy of Performing Arts is opening in Ibiza!